It’s game day here at the Simple Spoonful! Woot! Here’s how to play: Print out a blackline world map with all the countries. Now, truck yourself over to your nearest large chain grocery and take a good look at the produce section. Pay special attention to the stickers on the produce or the information on the plastic clamshells in which the berries or tomatoes come. Every time you can identify where the produce is coming from, you get to color in that country (or state, in the U.S.) on your map. You might have to ask a produce worker where certain things are coming from if you can’t tell–try it! It’s fun. Oh–just to boost the fun factor, let’s say every time you find something grown in your home state, you get an extra 500 bonus points. What you’re going to find is that you’ve got a remarkably international produce section. It’s like the UN in there. You’ve got apples in July because they’re coming from New Zealand, strawberries in January because they’re coming from Mexico, and grapes year-round because they’re coming from Chile. What you might also have noticed is that those January strawberries don’t taste anything like the June strawberries you get at the U-Pick place outside town. Eating seasonally means eating better. Not only do fresh fruits and vegetables taste better when they are allowed to ripen or reach maturity in the field, but their nutrition content happens to be higher. Have you, like lots of others, become unimpressed with store-bought tomatoes and long for the garden-grown ones you can only get in summer? There’s a reason for that. Some of it is the cultivar, or the specific type of tomato being commercially raised; because they are typically shipped a thousand miles or more, tomatoes are generally chosen for durability and shelf life over taste. Another part of it is the fact that tomatoes are usually picked green. Why pick tomatoes before they ripen? Same reason–they stand up to processing and shipping far better. Plus, tomatoes are easily and cheaply turned red with a spray of ethylene gas before shipping to stores. The only sacrifice in growing tomatoes this way is the flavor. Well, and local food cultures. And biodiversity. And terroir. And some of the nutrient value found in plants that reach ripeness slowly and naturally. And the livelihoods of small farmers. And some air quality from the fossil fuels burned shipping produce from one end of the country to the other. But other than that, it’s the same thing. One of the major points of last week’s Vegetarian 101 series is that sustainable, local agriculture using organic principles is a lot better for the consumer, the animals involved, and the environment than massive-scale factory farms and CAFOs. However, when most grocery stores depend so heavily on mass-produced foodstuffs, where can you get food produced in a better way closer to your own communities? Fortunately, there are options. Better still, in recent years, those options have been growing. 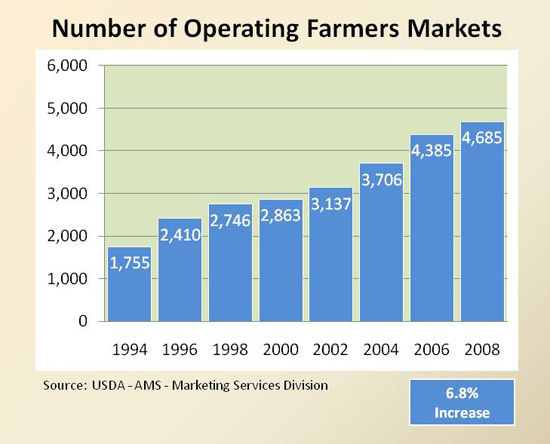 The graph below from the U.S. Department of Agriculture shows the growth in farmers’ markets from 1994-2008. Farmers’ markets aren’t the only way to work for a local, sustainable, less-polluting food culture, but they are the first of several options many consumers do have. In many cases, they are the most accessible, so let’s start there. What are the benefits of buying goods such as eggs, honey, and produce at a farmers’ market? Many communities are establishing year-round farmer’s markets as well. I am originally from southeastern Wisconsin, not too far from Madison. Madison is known for a thriving farmers’ market on the Capitol Square, and those tough birds just move indoors with their squashes and root vegetables when everything is buried under snow. The Phoenix area, where I live now, also has several year-round farmers’ markets that provide me with options even when the heat waves are shimmering up in August. I love the experience of farmers’ markets–you don’t necessarily know what you’re going to find when you go there, but you can often find treasures. It was at a farmer’s market that I first discovered ground cherries, for example. And the Concord grape. If you have ever tried to figure out why table grapes taste nothing like the purportedly grapey flavor of sodas and hard candies in shades of deep purple, you have obviously never tried a fresh Concord grape. They’re in season now! Strike while the iron is hot! While Whole Foods has been responding to pressure to increase its local offerings, co-operative grocery stores tend to have the market cornered on local products from meat to produce, from breads to honey. In my experience, price ranges quite a bit at co-ops. Sometimes what you’re looking for is significantly cheaper than it would be at a natural foods chain, and other times it’s more expensive. However, unlike most chain outposts, co-ops can offer some deals such as a wide variety of bulk bins (often including great rates for bulk olive oil, honey, agave nectar, and vinegar for those who bring their own containers), discounted produce and day-old bakery. The marvelous Willy Street Co-op in Madison, WI, for example, is a great spot to go bargain hunting. They take blemished produce, or peppers with a wrinkle or two on them and offer them in a discount bin at a seriously slashed price–less than a dollar per pound for organic produce, typically. You’ll get mixed bags with some peppers and eggplant, perhaps, or a whole slew tomatoes that should be used in the next day, but if you are a creative cook and are ready to go, you can have huge savings. If you have a co-op in your area, check it out to see what it has to offer and what the membership requirements are. If you have extra time, you may also want to consider volunteering at the co-op. Many co-ops offer memberships or discounts on goods for those who work a couple hours a week or a few a month. Keeping It Simple Tip: Many people believe that shopping at natural foods stores will break the bank. Believe it or not, these “specialty” stores might actually save you money if you intend to buy organic or naturally-produced items. The reason? They buy those organic items in greater quantities and get better deals than your generic Stop-n-Shop that just happens to have a scattering of organics. Also, many natural foods stores carry their own labels, which can be significantly cheaper than more widely distributed name brands. This is a lesson I’ve learned from years of comparison shopping. Try it yourself to see what’s true in your community. The concept behind a buying club is to reap the financial benefits of buying in quantity, then split up the items between an established group of people who split the cost. Basically, you set a shopping list (rice, millet, beans, olive oil, etc. ), calculate the cost for each interested party, then a coordinator orders the goods and splits them up so they are ready for pick-up by the rest of the buying club. While this seems like a good idea to me, it’s not one with which I have first-hand experience. You can use the net to search for buying clubs in your area, or you can read about suggestions on how to set one up. It’s fall, which means that a loyal contingent of ordinary Americans is making its way to orchards to get fresh apples and pears, Concord grapes and the last raspberries directly from those people raising them. It’s a good time of year. Buying directly from farmers is a great step toward food security and sustainability, as it cuts out that dreaded middleman and lets farmers keep more of the profit. Seventy years ago, there were nearly seven million American farmers. Now there are about two million, even though the general U.S. population has doubled. Between 1987 and 1992, America lost an average of 32,500 farms per year, mostly family farmers. Of those small farmers still on the land, 80% have farm incomes below the poverty line. They’ve had to earn most of their income off the farm. This has been the story in America for decades: more bankruptcies, fewer farmers and ever larger farms. 75% of U.S. farm production now comes from only 50,000 farming operations. Small farmers are more than pinched right now. They are disappearing at an alarming rate. Farming and ranching is tough work that requires smart, dedicated people, unless we want to go to a factory-farm method for all our food production. Unfortunately, there is little support for small farmers nowadays. Besides the occasional orchard trip, there is something else you can do to help small farms stay in business: consider joining a Community Supported Agriculture (CSA) program. Members of a CSA commit to supporting a local farm by contributing work and/or money shares. The Unicyclist and I are members of Crooked Sky Farms, which sells shares at the beginning of a 12-week session for $20 a week–$18 for the early birds. Although not certified organic, the farm has committed to using natural and sustainable farming practices, which is the key. Once a week, we go to an area church to pick up a mystery bounty of seasonal fruits and veggies that were picked only 24-36 hours earlier. If you’re a flexible cook, it’s a great set-up. CSAs also have additional benefits to the farmers. Farmers get the money they need to run their operation up front, and farmers with vibrant CSAs can actually budget rather than hoping and guessing at the income they might make at farmers’ markets. By being less dependent on farmer’s market sales, they may be able to cut associated costs: booth rental costs, gasoline costs to drive to what is sometimes a wide variety of farmer’s markets, and (since many CSA coordinators are volunteers or paid in shares) staffing costs. In addition, CSA members understand that, as seasonal shareholders, they are committed to helping farmers not be financially destroyed by the whims of nature. If flooding destroys or limits the harvest, for example, CSA members might not have too much to show in the way of produce for that season, but they are helping to keep that farm out of bankruptcy and around as part of their community to nourish them in future years. The Unicyclist and I enjoy our CSA immensely. While on the subject of buying directly from the producers, let’s talk about meat. Yes, really. If you are an omnivore and want to obtain your animal protein in a healthier, more ethical, and more sustainable fashion than buying plastic-wrapped meat from a factory farm, buying from a producer is the best way to get the most from your money. Many small-scale farmers and ranchers practicing organic or natural methods sell directly to the consumers at a price you won’t find at the Whole Foods, especially if you make a commitment to buy a large quantity, such as a half a pig or a quarter cow. If you have the freezer space and the money, it’s a great option to get good meat at a very reasonable price. If you don’t have the freezer space or the money, consider trying to round up a couple friends who will go in on a share with you. Of course, you can always grow your own. Backyards, front yards, rooftops, and windowsills can all be legitimate places to grow a few things you particularly enjoy, or which are particularly difficult to get organic around your home. Another option is the community garden, in which a plot of land is dedicated to providing a food share for anyone who is willing to dedicate a certain amount of time to helping tend it. Alternatively, some community gardens donate their fresh produce to food pantries. Any way you slice it, it’s good for communities. Many options exist for people looking to transition away from factory food and into real, sustainable food. If you don’t know where to find co-ops, farmers’ markets, local producers, or CSAs in your area, check out the links below. It’s a great step towards making a real difference. Local Harvest is an all-purpose site with an excellent site that allows you to search in your area for CSAs, farmers’ markets, co-ops and natural grocers, farms, restaurants, and online stores. The U.S. Department of Agriculture has a searchable database of farmers’ markets. EatWild allows you to look up pastured (naturally-raised, grass-fed) animals by state, including dairies.